New data from NASA’s Cassini spacecraft has helped scientists better understand how Titan’s liquids, solids and gases interact, revealing clues about Saturn’s Earth-like moon. This colorized movie from NASA’s Cassini mission takes viewers over the largest seas and lakes on Saturn’s moon Titan. The movie is made from radar data received during multiple flyovers of Titan from 2004 to 2013. 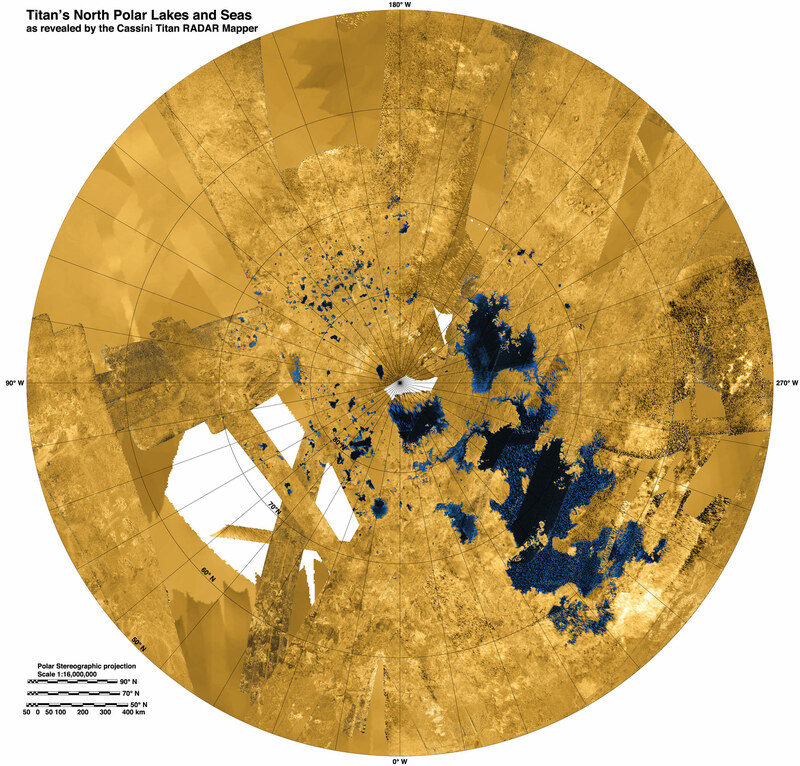 NASA’s Cassini spacecraft is providing scientists with key clues about Saturn’s moon Titan, and in particular, its hydrocarbon lakes and seas. Titan is one of the most Earth-like places in the solar system, and the only place other than our planet that has stable liquid on its surface. Cassini’s recent close flybys are bringing into sharper focus a region in Titan’s northern hemisphere that sparkles with almost all of the moon’s seas and lakes. Scientists working with the spacecraft’s radar instrument have put together the most detailed multi-image mosaic of that region to date. The image includes all the seas and most of the major lakes. Some of the flybys tracked over areas that previously were seen at a different angle, so researchers have been able to create a flyover of the area around Titan’s largest and second largest seas, known as Kraken Mare and Ligeia Mare, respectively, and some of the nearby lakes. These new images show Kraken Mare is more extensive and complex than previously thought. They also show nearly all of the lakes on Titan fall into an area covering about 600 miles by 1,100 miles (900 kilometers by 1,800 kilometers). Only 3 percent of the liquid at Titan falls outside of this area. A creative application of a method previously used to analyze data at Mars also revealed that Ligeia Mare is about 560 feet (170 meters) deep. This is the first time scientists have been able to plumb the bottom of a lake or sea on Titan. This was possible partly because the liquid turned out to be very pure, allowing the radar signal to pass through it easily. The liquid surface may be as smooth as the paint on our cars, and it is very clear to radar eyes. The new results indicate the liquid is mostly methane, somewhat similar to a liquid form of natural gas on Earth. One implication is that Cassini scientists now can estimate the total volume of the liquids on Titan. Based on Mastrogiuseppe’s work, calculations made by Alexander Hayes, of Cornell University in Ithaca, New York, show there are about 2,000 cubic miles (9,000 cubic kilometers) of liquid hydrocarbon, about 40 times more than in all the proven oil reservoirs on Earth. As Cassini gets closer to northern summer in the Saturn system, mission scientists look forward to potentially the most exciting time for weather at Titan’s northern hemisphere. The Cassini-Huygens mission is a cooperative project of NASA, the European Space Agency, and the Italian Space Agency. JPL, a division of the California Institute of Technology in Pasadena, manages the mission for NASA’s Science Mission Directorate in Washington. JPL designed, developed and assembled the Cassini orbiter. JPL and the Italian Space Agency, working with team members from the US and several European countries, built the radar instrument. 1 Comment on "Cassini Reveals Clues about Saturn’s Moon Titan"
Thank you for including clear subtitles with your video clip titled “Cassini Reveals Clues about Saturn’s Moon Titan.” I am hearing impaired and can’t understand spoken speech unless it’s face-on. But this presentation was fabulous; it’s a very good way to bring fascinating science topics to everyone, even those people learning English!